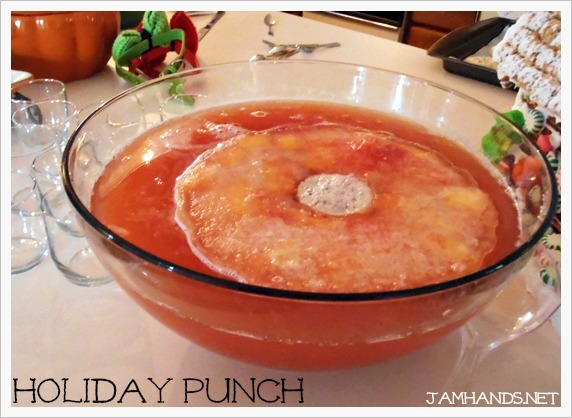 Punch is something that I consider mandatory for parties. Does anyone else feel that way? I love it. Typically punch recipes make a ton, they are delicious, and they are very adaptable so if you have random juices in your freezer or fridge, they tend to taste great no matter what you use. This recipe for Holiday Punch comes from Dessert Now, Dinner Later. I actually added a bottle of cranberry-apple juice to this just to stretch it. Next time around I will make it with just the called for ingredients to get just the pineapple and tropical punch flavors. 1. Mix the juice, Kool-Aid, water and sugar. Chill. When ready to serve, combine in a punch bowl with the club soda and stir gently. Recipe from Dessert Now, Dinner Later.